Russia and Turkey have agreed on the route of the ‘Turkish Stream’ pipeline under the Black Sea. The first gas pipe with a capacity of 15.75 billion cubic meters will be operational by December 2016. The four threads which make up the pipeline will have a capacity of 63 billion cubic meters, Gazprom said in astatementfollowing Tuesday’s meeting between CEO Aleksey Miller and the Turkish Minister of Energy and Natural Resources Taner Yildiz. Russia will pay for the laying of the undersea pipeline while the capacity within Turkish territory will be developed jointly. The participating shares will be discussed at further meetings. The Turkish government has appointed Botas as its representative company to run the project. Gazprom and Botas will prepare a joint plan for the implementation of the project within a week. "Our priority is analyzing the route options in Turkish territory, defining an exit point from the sea, the point of delivering gas to Turkish consumers and the point of crossing the border between Turkey and Greece,” said Gazprom in a press release. The first gas is expected to be delivered to Turkey in December 2016. 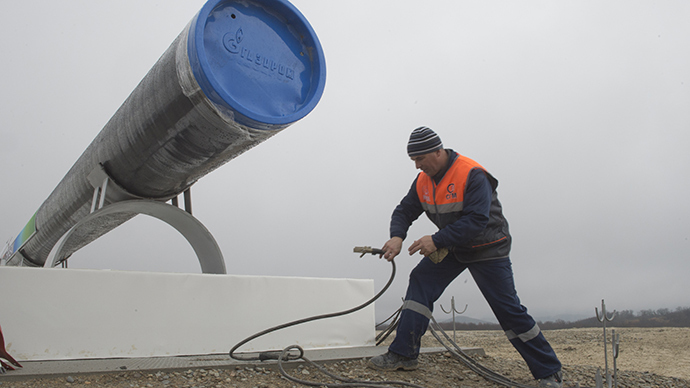 Earlier in January, Gazprom’s Sergei Kupriyanov said the construction of Turkish Stream will take a little longer than South Stream which was planned to be completed by 2017. Russian President Vladimir Putin announced a halt to South Stream construction on December 1 because of the EU stance over its third energy package. The offshore part of the cancelled pipeline with the capacity of 63 billion cubic meters of gas per year was supposed to go under the Black Sea to Bulgaria with a further route through Europe, ending at Austrian gas hub in Baumgarten. Gazprom says European companies will be able to purchase gas at a gas hub which is expected to be built on the border between Turkey and Greece. The gas supplies via South Stream were supposed to replace about two-thirds of gas supplies, which are now transmitted through Ukraine. The contract between Gazprom and Naftogaz of Ukraine on gas transit expires in 2019.